A Quiet Corner: "You Found a WHAT?" "A shark. 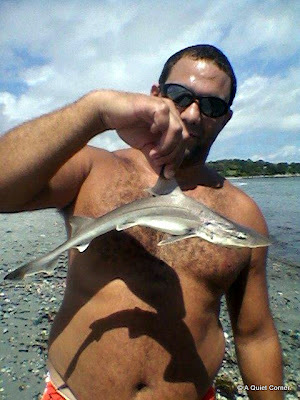 A baby shark...washed up on shore...right over here. Come and see it!" If there's one there's another. Holy crap moose~poops! Right where we swim. Perhaps that's what happened to the "other eleven" who never returned! Maybe the water was too cold for it. Mom must be worried sick! JP.. sharks Grow up indeed. where there is a baby, there must be a mother.! Everything has two ways this baby has definitely got the 'oh poor baby' element which is sweet BUT as always the parents issue comes to the forefront. To continue to swim there? Mmm tricky, I'll watch out for a post on swimming there without mishap! Nice photos. I would be THRILLED to see another shark in the wild. I've only seen one. i would be thinking the same things! You know the 'bad' neighbors? Driving.me.nuts. Looks bad on me I know but I'm thinking one less set of jaws in the ocean could be a good thing. Just doesn't seem to matter what kind of animal or mammal it is, babies are always cute. Did you put it back in the water? So who was that holding the shark? It might be what I've heard could be a dog shark and so not a baby at all.